Sydney-based musician Liz Martin was in Adelaide (from 13 July-22 July 2018) conducting workshops for Access2Art’s SNDCLSH project. She worked with local artists to develop and use assistive music technology. 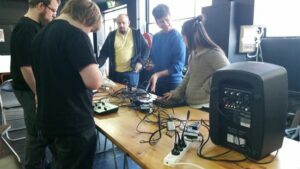 Writer Indigo Eli interviewed Liz to find out what assistive music technology is, what they were working on and what it is about sound that gets Liz all excited. Hi Liz! Firstly welcome to Adelaide. So, can you tell me about the SNDCLSH workshops you’ve been running for Access2Arts? We started with a lab day with myself Dan Thorpe, DJ Trip and Pix from Hackerspace to explore the gear and see what was what, so that then we could look at how they could be used and then taking them out onto the road and using them in The Mill space to do workshops. So it’s been great, fantastic, really varied and sort of trying different approaches with each workshop. So it’s not one workshop repeated. Each has been very different in the approach, which says a lot for all the different ways you can make music and all the different ways you can use gear. What exactly is ‘assistive music technology’? Interesting question. I would say some of the gear in the collection is and has been purpose built for people who might need to access music in a different way… So half the gear has been specifically made for people with disabilities. And they’re different kind of controllers, different ways of interacting physically with the sound. And the other half of the gear is what you would call more a ‘universal design’ sort of approach and it’s stuff that’s fairly accessible to anyone. It was just beautiful to see someone that’s used to maybe sitting back actually being able to get fully involved in the process of playing sound and his own sound, mixing that with the gizmo gadgets that lets him create in a different way. So the most common, the one piece of gear that we’ve used that is super accessible, super easy to use because of the design and the layout, everything, there’s no hidden menus you know – you can jump straight in, you turn a dial, you push a fader, pull a fader up, pull it down … you can hear the immediate changes, and it’s just very visually laid out – and that is a vocoder. I don’t know if you know what a vocoder is but basically, it’s two sounds: a voice and a synth played together that creates this crazy kind of often a robot voice. Probably the most famous sort of sound is the Daft Punk robot voice. So that’s a vocoder… It’s super easy to use and people just love it! So we played with that heaps today. It works really well for people who like to talk a lot or that like to sing a lot. It’s really great for them. It’s really fun and they get to enjoy their voice in a different way. But it’s also great for people who are a little shyer. It gives them this other persona for them to play with. There was one guy today who’s super shy, you know I could barely get a word out of him, but as soon as he got on the vocoder he was chatty, he was exploring, he was making all sorts of sounds: long sounds, short sounds, high sounds, low sounds. It was so much fun and he was laughing. It was just beautiful to see someone that’s used to maybe sitting back actually being able to get fully involved in the process of playing sound and his own sound, mixing that with the gizmo gadgets that lets him create in a different way. It’s really about exploring, which is so great. Often these sorts of things you’ve got to write xamounts of songs and you’ve got this limited time and it can get a bit … you know, the pressure’s on. Whereas, this is actually one of the most important stages of any kind of creativity which is just playing and exploring and not feeling the pressure to make something immediate, but actually just to give yourself over to that sense of play that is the base of any kind of creative exploration and creative process. Yeah it’s really valuable isn’t it, having that. Yeah. And so much fun. I have this belief that everyone is your teacher in some way. So what have you learnt from the process, the artists or the SNDCLSH residency as a whole? We worked with Tutti today and I walked away with this refreshed sense of fun because everyone got into it, everyone had a go, no one was holding back. Sure, people were nervous and you could see them approach the staff and you could see their curiosity but also their nervousness. And sometimes they’d say “oh I’m nervous I’ve never done this before”. But they wouldn’t let that get in the way of having a go and exploring. And that’s really fun. So that was a great reminder for me today – to just to give things a go, especially in a creative space there’s no real way that you can make a mistake, you’re just expressing. So what get’s you excited about working with sound and music? For me personally, it all started with having a space that I could express. So when I first started it was all about communicating in a different way, getting emotions out. We’re talking years ago. Many, many years ago [laughs]. So I love that… I love sound. I love the sound of gravel, of walking on gravel. I love just textures and sounds and I love moving and dancing to music. I love driving and singing loudly when no one else is in the car. There’s so many ways that I enjoy music in different spaces. I think it would be great if everyone had an opportunity to be able to create music and explore music, explore making music. And so these workshops give an opportunity for people to do that. … it gives people a chance to try out some gear and play and explore. I think that’s a wonderful thing; to give opportunities to all sorts of people to create. And I don’t think you necessarily need to be a classical composer that’s studied for many years. I think there’s a lot to be said for people, for beginners, trying music and exploring. And I think wonderful music comes out of that time of exploring. What gave you your start in music? I grew up in a family that was really into music. I was surrounded by music – my family, my extended family, there was a real importance placed on music and listening to music and learning music. And I still remember seeing a guitar and wanting to buy this guitar. And I’d had piano lessons, but seeing this guitar it’s like ‘oh my god I’d love one of those’. And my parents actually went about getting me one which was very unusual – we didn’t have any money so this is amazing. I just started there and then really exploring, starting to write. I would have been pretty young, we’re talking ten or twelve, writing my own stuff. Playing piano, always writing my own tunes. It’s just always been like this for me, always wanted to play and learn. And then just gradually moved into different stuff, started making electronic music when a lot of this gear became more accessible to everyone, you could have your own gear at home and start making stuff… everyone can make their own stuff now if you have a computer. Is there anything else you’d like to add before we wind up? It’s been a fantastic time. I’m really happy Access2Arts invited me to come down and do this. I walked away with this refreshed sense of fun because everyone got into it, everyone had a go, no one was holding back. It’s been really beautiful to work with other musicians at all stages in their music practice from established musicians like DJ Trip and Dan Thorpe through to beginners exploring sound. It’s been super fun. Find out more about Liz at her website.